Riding Spinney was part of the Rothley Temple Estate and once was part of the garden of The Temple, now the Rothley Court Hotel. It is now privately owned as part of a garden but managed as woodland. This spinney is covered by a Group Tree Preservation Order. Riding Spinney runs along the The Ridings as far as The Ridgeway, opposite the Rothley Court Hotel on Westfield Lane. 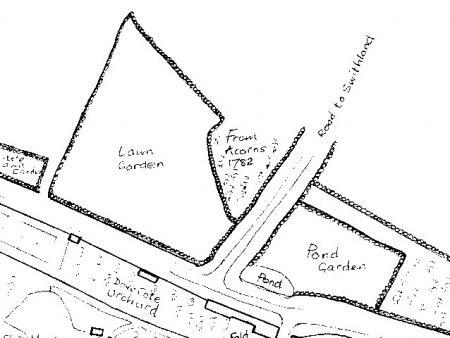 As you can see from the map above, Riding Spinney was planted from acorns in 1782. This map was prepared in 1819 for Thomas Babington and the tree planting dates were added in script by Thomas Babington in 1823. When Riding Spinney was surveyed in 1988 it was classed as a Site of Interest at Parish Level for its species which included Field Maple, Sycamore, Ash, Holly, Wild Privet, Wild Cherry, Common Oak, with the latter being the most dominant. Bluebells and Dogs Mercury were recorded as ground cover. A visit was made in March 2002 and it was good to see that Dogs Mercury and Bluebells were still there in abundance. Although there was a lot of Wild Garlic the owner said that this had been introduced about 8 years ago and had spread well. Violets were also present with Yellow Archangel and Wood Anemone. Oak trees were still dominant and two were recorded as part of the Ancient Tree Survey. One had a girth of 3.8 metres and the other 3.7 metres. There was a very active Rookery at the time of our visit but Rooks have always been a feature of this part of Rothley. 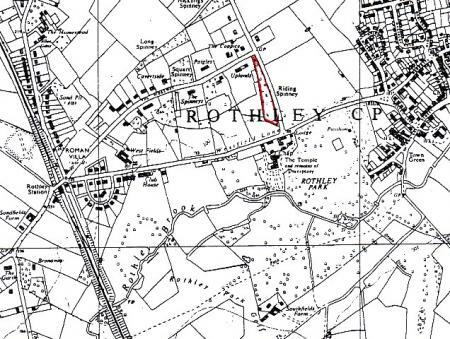 The above survey was carried out as part of a report on a field by field survey of Rothley Parish July-September 1988 by P.A.Evans.